So you have your shiny blue or yellow box up and running and life is good. 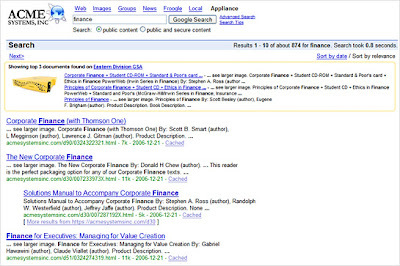 As the searches keep coming, you begin to wonder.... How many of my users are clicking on the first search result? How many refine their search? How many use the Advanced search capabilities? How many click on a KeyMatch? How many have to click the Next page link? How many aren't finding what they want? Now you can answer these and hundreds of other questions with the introduction of Advanced Search Reporting for your Google Mini or Google Search Appliance. Through a detailed analysis of what your users are clicking, you can now extract volumes of rich behavior detail that you can use to improve your search quality and their search experience. Owners of a Google Mini or Google Search Appliance can visit Google Enterprise Labs to download this feature today! And lots of people who go online with their phones aren't doing it that way for lack of a computer. Even with its small screen and squashed keyboard, my phone has become my web-connected device of choice in lots of situations. Like when I'm visiting a new city and need directions, when I want to send a quick email from a ski lift, or when it's just easier to reach into my pocket than fire up my MacBook. These are some of the reasons why Google is committed to improving the mobile experience. The latest example, launched today, is Google Sync for mobile. This application for BlackBerry® smartphones keeps your Google Calendar in sync with your BlackBerry® calendar. So whether you update your schedule from your mobile device or from your computer, your agenda will be up to date however you decide to access your information later on. You can download Google Sync for mobile by going to http://m.google.com/sync on your BlackBerry® browser. And for more about the other ways Google Apps users – including those without smartphones – can access their information on the go, check out the Google Apps mobile access overview. Postini is a recent addition to Google that offers solutions that help enterprises make their existing email infrastructure more secure, compliant and productive. We process email for more than 35,000 businesses and 12 million end users, and block about 1 billion messages per day, which is a good sample size to report on global spam trends for businesses. In 2007, Postini data centers recorded the highest levels of spam and virus attacks in history. Much of this was fueled by an increase in the number of botnet computers being used to send spam. Botnets are networks of infected PCs, usually with broadband Internet connections that are co-opted by hackers and used to send spam and virus attacks. Often they are compromised without their owner's knowledge. We started to see these botnets kick in back in September of 2006. Since that time, spam volumes are up more than 163 percent. 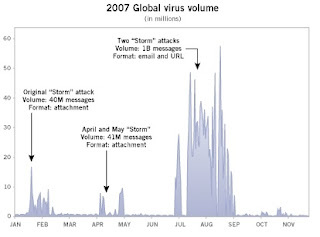 We saw a peak of activity in October 2007 where volume was a 263 percent increase from September 2006 and Postini blocked 47 billion spam messages, more than 320 Terabytes of spam (now that's a lot of spam). The average unprotected e-mail user would have received 32,000 spam messages in their in-boxes so far this year. Talk about lost productivity. In fact, Nucleus research estimates unchecked spam can cost a company up to $742 per user. But what's really different this year is the innovation with which spammers attempted to evade detection by spam filters. In the early part of 2007, image spam was used heavily, with the spam content (such as "pharmaceuticals for sale," "hot stocks," etc) contained in an image attached to the message. 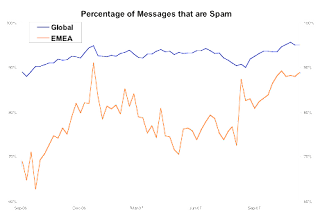 Over the course of the year image spam declined and was replaced by PDF spam, document and spreadsheet spam and even multimedia spam. That's right - an audio file promoting a particular stock. We saw examples of compressed and password protected emails as well. All this effort to deliver spam content in email attachments had a significant impact on the size of spam overall. Taking 7.5 Kb as an average spam message size, an organization with 100 employees (that didn't use a hosted solution to block spam outside the firewall) would have wasted 22Gb of storage and bandwidth. Who wants that sitting on their servers? 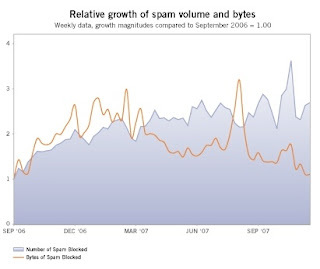 Spam volume will stabilize and could actually decrease in 2008 as spam attacks become more targeted and less of a pure volume game. As more and more spam content will be contained in attachments, we do expect that the overall size of spam will continue to increase. Virus attacks will continue to blend with spam and will focus more on identity theft. They will utilize increasingly sophisticated social engineering techniques that will be related to specific current events such as the Olympics, the Super Bowl, natural disasters etc. Virus attacks will become more targeted toward executives at specific companies and will appear to come from legitimate business agencies. Their goal will increasingly be to steal corporate and government data. We expect to see several of these types of attacks, leading to data breaches from commercial enterprises and government agencies. This may force some companies to modify their email practices, such as financial institutions not including any links in their email communications to customers. More businesses and organizations will implement specific policies that address outbound content in email and will deploy systems to monitor and enforce those policies to prevent sensitive or confidential data leaks. The growing need for managing consumer data privacy and retention policies globally will drive growth of encryption and archiving and hosted solutions will play a major role in reducing the cost and complexity. Identity theft attacks will increasingly be launched through web sites, especially those that enable user created content such as social networking sites, blogs and auction sites. If you’d like to know more about Postini’s spam and virus trends, you can read our weekly summaries on the Postini Community Forum in the Threat Advisory board. Do you have multiple Google Minis or Google Search Appliances? Many customers have several yellow and blue boxes spread across different departments, regions or even continents. Wouldn't it be great if you could easily see if there were other relevant search results from another Mini or GSA half way around the world? Silicon.com recently published this case study about how Monarch Airlines set up Google Custom Search Business Edition on www.flymonarch.com to enable better customer self-service and reduce the number of customer support inquiries. As a result of deploying the search engine – which only costs $100 per year - Monarch saw a 30% decrease in the number of customer support inquiries. The case study cites a number of the great benefits of deploying Custom Search: speed, relevance, and customizability. Monarch also uses Google Analytics to understand how their site's visitors navigate. If your website's search isn't yet powered by Google, learn more about CSBE.